Finding that the situation had calmed down in Antwerp, Tyndale returned to the city sometime in 1529. Antwerp provided a number of advantages for Tyndale. First, it would be safer because the city did not have a cathedral with no resident Bishop who would be on the lookout for heretics and no university with a theological faculty. Antwerp was closer to England so the task of transporting Bibles and Testaments would be easier. In addition, Antwerp boasted of nearly sixty printing establishments. Although it was illegal to print heretical books, many of the printers were willing to turn a blind eye if a profit could be gained. Finally, the Merchant Adventurers’ house was located in the city. Not only was this the headquarters of those who would aid him smuggle the Bibles into England; the house itself provided immunity from search and seizure although we will note that these freedoms were violated in the case of Tyndale. Having finished the translation and printing of the New Testament, it was only natural that Tyndale would turn to the books of the Old Testament. As we noted previously, there is uncertainty where Tyndale learned the Hebrew language because most students of his life are convinced that he did not know the language when he departed from England. In reality, it would be some years before the teaching Hebrew became a standard practice in British universities. Regardless where Tyndale learned Hebrew, there is no doubt that he mastered the language. There is good reason to believe that Tyndale perfected his translation of the first five books of the Old Testament during his stay in Hamburg. Thus with a prepared manuscript, it was a matter of finding a printer who would be willing to undertake the work. Although the book purportedly was printed by Hans Luft in Malborow, it was to hide its real origin. It is true that Luft was the printer of Luther’s works and he indeed had presses in both Wittenberg and Malborow. However, the true printer was Johannes Hoochstraten of Antwerp. The book itself contained the books of Moses but there was something distinctive about it. The books of Genesis and numbers were printed in the Gothic or black letter type while the remaining three books of Exodus, Leviticus and Deuteronomy were printed in Roman type. Scholars have debated the reasons for the differences in the types for a number of years. Although it appears that the entire five books were printed by Hoochstraten, it has been surmised that there was insufficient type to use just the black letter. Because the work was done secretly and was hurried through the press, it was necessary to use different type faces. Some have conjectured by the different type faces that the individual books were originally printed so that they could circulate separately. However, this does not appear to be the case because when Tyndale issued a second edition of the Pentateuch in 1534 only the book of Genesis had been revised. However, in the second edition this revision of Genesis was printed in Roman type. Perhaps Tyndale had planned to revise all five books but was prevent by circumstances. In this edition Tyndale wrote prologues to each of the books giving a short summary of its teaching. However, in the book of Exodus he included eleven woodcuts. 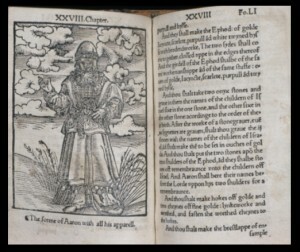 One of the woodcuts was a picture of Aaron dressed in his High Priestly robes. Another was a depiction of the Ark of the Covenant in the Holy of Holies. Like the New Testament, the Pentateuch had to be smuggled into England because English translations were still proscribed. There is no definite authority that states how many of these were printed but it probably would have been in the same number as the New Testament, about three thousand copies. At the present time estimates say that between six and eight of these Pentateuchs survive, some in mutilated form. The Pentateuch was reissued in 1534 with the only differences appearing in the book of Genesis. The title page of Genesis reads as follows: The firste Boke of Moses called Genesis. Newly correctyd and amendyd by w.T. M.D. XXXIIII. The book of Genesis was printed in Roman type, whereas in the first edition it had been printed in Black Letter or Gothic type as we noted above. Apparently in the same year or perhaps the following, Tyndale translated and printed the book of Jonah. For a period of time there was no extant copy of the work and some scholars believed that it did not exist. However, it was discovered in 1861 by the Bishop of Bath and Wells. It was printed in Black Letter by Martin de Keyser of Antwerp. It is only twenty four pages in length as Jonah is one of the shorter books of the Bible. The prophete Jonas with an introduccio before teachinge to understode him and the right use also of all the scripture and why it was written and what is therin to be sought and shewenge wherewith the scripture is locked upp that he which readeth it cannot understode it though he studie therin neuer so moch: and agayne with what keyes it is so opened that the reader can be stopped out with no sotilte or false doctrine of man from the true sense and understondynge thereof. It is well worth the time and effort to understand exactly what was contained in this introduction. To do so, it is necessary to reflect on what Tyndale had spoken to his friend while at Little Sodbury Manor. He said that if God would spare his life, he would make the ploughboy know more of the Scripture than the clergy of the Church of England. We must understand that Tyndale was convinced that Scripture was the means to confirm people in the faith and without the Scripture in the vernacular language it was impossible to do so. However, the bare text or translation of the Scripture into the English language was the first step. It was also necessary to give the ploughboy the “key” to understand and interpret the Word of God. With this in mind, let us return to the title page again because there are several things of importance that Tyndale states. We will note what he says in the order that he mentions them because Tyndale reveals his hermeneutical method of understanding and applying the Word of God. The first thing of importance in regard to Jonah is to understand what he has written. Jonah had written an experience of his own life but that experience must be understood in the context of God’s commission to Jonah to preach His message to the people of Nineveh. We know that Jonah disobeyed God and sought to flee from His presence. The message of Jonah must also be understood in the context of all the Word of God. The Word of God reveals God to be a God of compassion and mercy even to those who have revolted against Him. To those who do not deserve mercy, God sends His messengers to announce His message of grace and mercy. However one encounters a difficulty because the Scripture is locked up and the person (ploughboy) cannot understand it. Even though he applies himself assiduously to the task, the true meaning and application evades him. However, Tyndale provides a key so that the teaching of Jonah can be understood or opened to the mind of the ploughboy. Why is this necessary? In the last part of the title Tyndale gives us the reason. It is so that the reader can be delivered from the subtlety and false doctrine of man. The church not only had failed to give the ploughboy the Scriptures, what they had taught him was not the true meaning of God’s message but the subtle and false teachings of man. What is to be the result? The person reading the book would come to the true sense and understanding of what Jonah had written. It appears that Tyndale translated Jonah into English so that he could use the book to give the ploughboy the key to understanding all the Scriptures. But why did he translate Jonah and not one of the other books of the Old Testament? While there may be differences of opinion, it is the writer’s opinion that this little book served admirably to accomplish Tyndale’s objective. It was a small book; it described graphically the experience of the Prophet in his disobedience and chastisement. However, most of all it demonstrated and portrayed the gracious character and mercy of God Who showed grace even to those who were the enemies of His people. From the response to the book, we can see the division that existed in the church. The Bishop of London, John Stokesley, denounced it out of hand. This should not surprise us as Stokesley rapidly gained a reputation for cruelty against heresy. 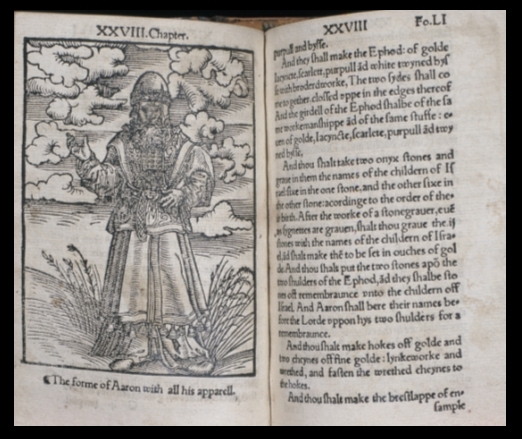 However, Tyndale’s friend John Rogers printed Tyndale’s Prologue to the book in his edition of Matthew’s Bible in 1537. Thus Jonah served as a fulfillment of Tyndale’s desire to have the ploughboy know the Word of God.